Happy New Year! We are starting off the new year with a bang… the guide continues to grow, website traffic is increasing, and more providers are posting events and using RetirementConnection.com as a resource. We are down to the very last few boxes of the current guide, please let us know if you need to order additional copies and we will get those delivered quickly. I encourage you to add your label “compliments of…” to the cover of the guide and share it with the families you serve. Families really appreciate having a comprehensive guide of resources. We list EVERY housing and homecare resource in the area and hundreds of other helpful listings. 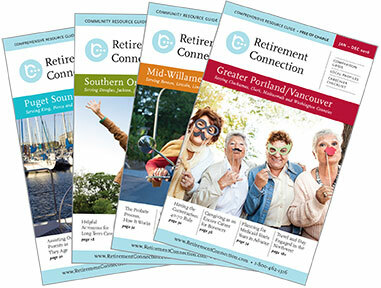 Retirement Connection of Puget Sound is printed annually, and the next one will be out in April. Please email me any additions or edits that you want to be included; I want your insight, so we can continue to grow and improve. "Be strong enough to stand alone, be yourself enough to stand apart but be wise enough to stand together when the time comes." It is challenging to be all of these, and an even bigger challenge to know when is the right time for each. It is incredibly gratifying when you have the courage to stand alone, then turn to see so many others standing with you.